Get your pink on this Saturday at the BrisStyle Indie Mother & Child Market where I'll be launching my new range of candy pink hand-embroidered brooches, the cutest accessory for little ladies. Available for the month of October, 50% of each pink brooch sold will be donated to Chicks in Pink, the thinking chicks charity and official charity for Saturday's market. 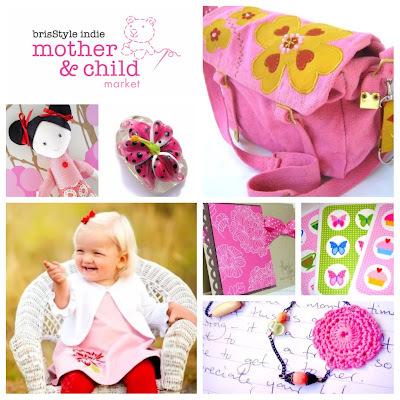 Come along and check out the BrisStyle Indie Mother & Child Market on this Saturday 9 October from 9am-2pm at St Augustine's Church Hall and Grounds, Racecourse Road, Hamilton. The BrisStyle blog has all the details! And if you can't make it along candy pink brooches will be available in the shop soon! Yep, 50% of sales will be donated to the Mater Hospital's Chicks in Pink charity who do amazing work for those affected by breast cancer. The pink brooches are so sweet! I can't decide which image is my favorite. I just went to your shop and saw more of your beautiful pendants. I love mine! The brooches are absolutely adorable! It was a pleasure looking at your embroidery work on the brooches as well as other items on your blog.